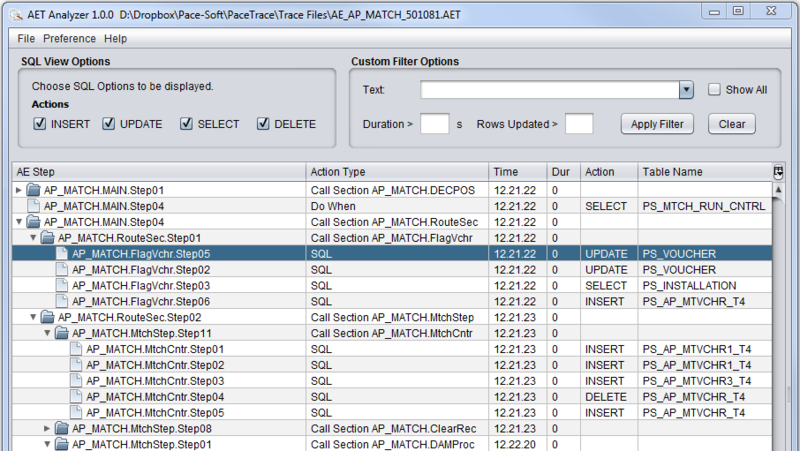 Oracle copied Pace-Trace and included it in the latest release of PeopleTools (8.55). 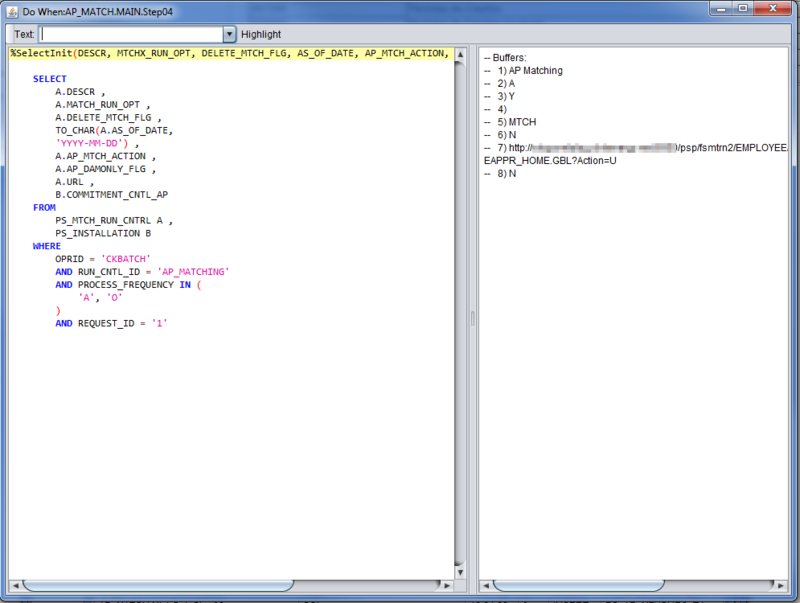 The tool is called “AE Log Analyzer” in their documentation, although the title bar of the program is “AET Analyzer”. They say imitation is the sincerest form of flattery, and (now that enough time has passed) I must say I do feel flattered. They built the tool using Java, so the interface feels a bit odd, but overall they put little effort into hiding the act of creating software that functions the same as my own. Considering the company is valued at over $180 billion, it is indeed high praise to have my work copied directly. At the same time, I do admit to feeling at least a bit slighted. Should they have reached out for permission, offered any compensation, or at least said “Thank You!” for the idea? Did they do anything illegal here? After reaching out to a few lawyers, they indicated any attempt to fight them on this would be futile. As just mentioned, they are incredibly large and have a powerful legal team just waiting to strike down a small company’s challenge, regardless of merit. There is one more trick that is pretty handy – if you trace PeopleCode for your AE program, you can then load that file after your AET file and Log Analyzer will match up the two so you can view the PeopleCode that ran for a particular step. I do like that one for sure. 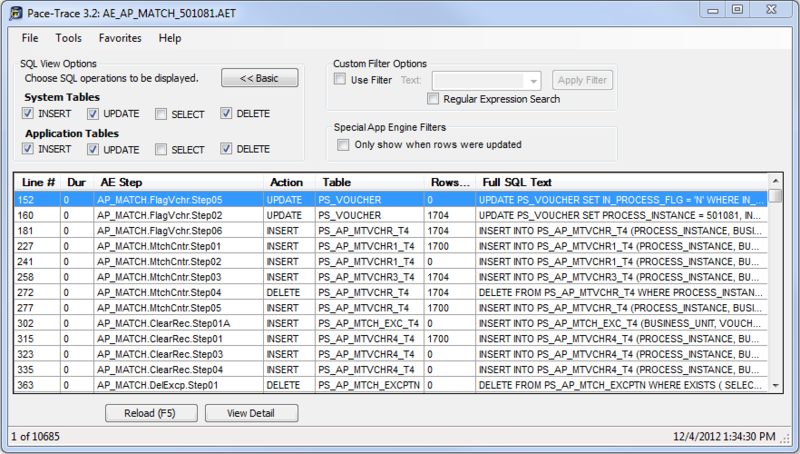 Still, it does not assist in reviewing SQL trace files created from online and batch files, including not just the AET files (which AE Log Analyzer views) but also the “tracesql” files which are built from online and batch tracing. There are also quite a number of additional features (exporting, creating reports, and many others), that this does not do. 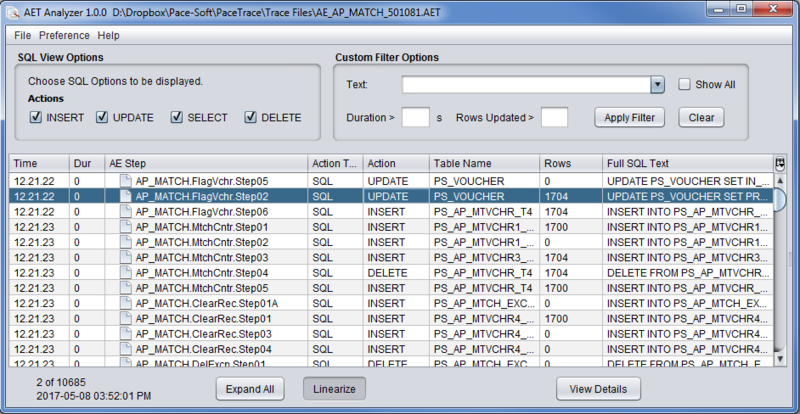 You can read more on the features of Pace-Trace here. Online Documentation: See Using Log Analyzer online. Within the Application Engine PDF documentation, see Chapter 9.